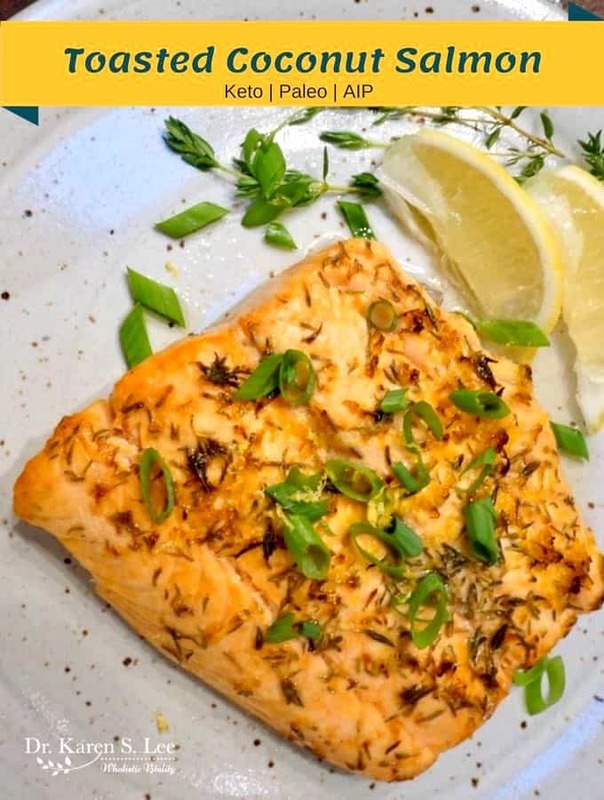 Toasted Coconut Salmon from Made Whole cookbook is one of my favorite ways to prepare salmon now. Top it with dried or fresh thyme and the subtle herb flavored flaky fish will melt in your mouth. When my fellow food blogger/friend Cristina Curp’s book Made Whole (Amazon Affiliate Link) was finally released, I was ecstatic to receive a copy for review. 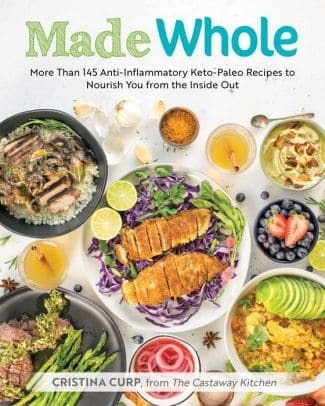 Cristina had health issues since puberty and the book explains how she tries to heal her autoimmune disease with Paleo and Autoimmune Protocol and tackle her weight problem with (Paleo) Ketogenic diet. I couldn’t wait to dive in and learn how she did it in detail. I was aware of her struggles with Hidradenitis Suppurativa and her food intolerances since I’ve been reading her blog The Castaway Kitchen, and salivating over her autoimmune protocol/allergy-free recipes. But what I didn’t know was that she was writing this amazing book until this year! She is a chef so I admire her knife skills and it makes sense that she wrote a cookbook. 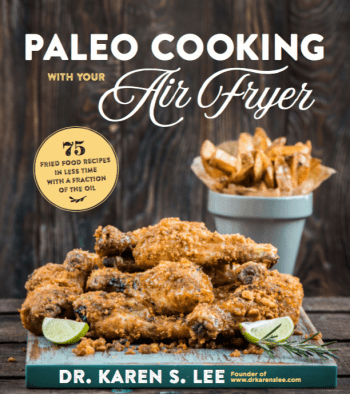 Besides, her creative rendition of allergy free recipes are so simple and yet so tasty that I was dying to get my hands on the 145 recipes in this cookbook. Not only are these recipes allergy friendly, they are mostly Paleo-Ketogenic, which is what she followed in the last year or so. She’s honest about her health journey in the book, explaining how she became ill and what she did – and still doing – to get better. 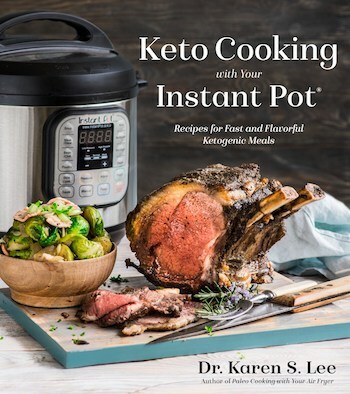 She talks about leaky gut, the autoimmune protocol, paleo, keto, pantry list, food substitutions, 2 week AIP meal planning menu, and so SO MUCH more! You just have to get Made Whole if you have autoimmune issues. It’s like a textbook, spoken in easy plain English. Reading the book was like listening to her Instagram Stories – REAL! Speaking of which, if you have Instagram, you have to follow her AND watch her stories. She’s like a girl next door, and she talks to you like she’s in your living room, sitting across from you on the couch. Or making you a gourmet meal in your kitchen. I’m not kidding. 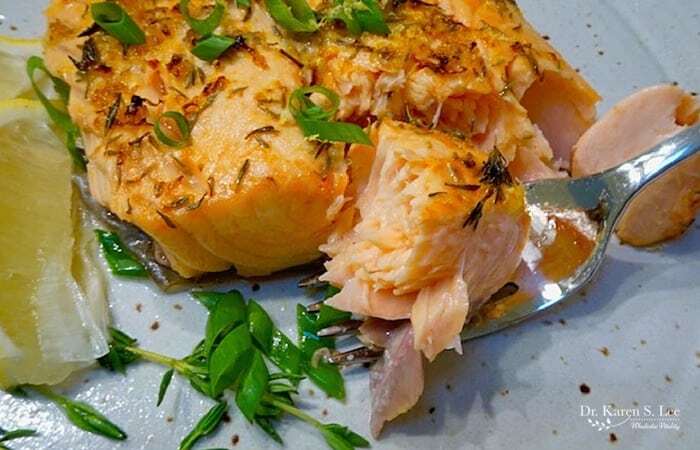 She was generous enough to share this scrumptious salmon recipe with you so you can scroll down to the recipe. But first, a tip about buying salmon. There. That’s about it. But wild caught salmon. That’s my tip. In fact, when you buy any seafood, it’s best to buy wild caught. Not farmed. Seriously. Salmon is one of the very few fish I cook. I can still find reasonably priced wild-caught salmon at local stores or even online, depending on the season and availability. It is very important to buy wild caught salmon instead of farmed salmon (<– watch the documentary) since it’s cleaner and more nutritious. Farmed salmon is fed chemicals, hormones, unnatural feeds, and more importantly, they may be genetically engineered. Who wants that? So whenever wild caught salmon is on sale, stock up. Ask them for frozen salmon and don’t re-freeze the defrosted salmon in the case. Lay the salmon skin side down on a sheet pan. Run your fingers along the length of the fish to check for pin bones. They will be difficult to see but easy to feel. If they are present, use kitchen tweezers or pliers to pull them out. Sprinkle the fillet evenly with the salt. Let it sit at room temperature while the oven preheats. When the oven is ready to go, sprinkle the nutritional yeast evenly over the fillet, then, sprinkle the coconut butter over it, leaving clumps of it here and there. Sprinkle the lemon zest and then the thyme over the fillet, as evenly as possible. Roast the salmon on the middle rack of the oven for 5 minutes, then set the oven to broil. Broil for 2 to 3 minutes, until the clumps of coconut butter are browned and the fish is cooked through. If you're making king salmon, which tends to be much larger, it may need to cook longer. A good indicator that the salmon is ready is that the meat flakes easily. Test this at 1-minute intervals until the thickest part of the fish easily flakes when pierced with a fork. Remove the salmon from the oven. Let it rest for a few minutes, then garnish the fillet with the green onion slices. Slice the fillet into as many portions as you need, and lift the pieces off of the skin with a spatula to serve. Sore leftovers in an airtight container in the fridge for up to 4 days. To reheat, flake and sauté the salmon in a skillet over medium heat for 4 minutes.